DNV GL released Port State Control statistics for 2014 which show that the most frequent type of deficiencies recorded by PSC on DNV GL vessels last was ISM related deficiencies. A big part of the deficiencies recorded by PSC falls into the ISM category and/or should be related to ISM. Even minor but numerous deficiencies can make the PSC inspector conclude there is possible ISM failure and detain the vessel due to this. 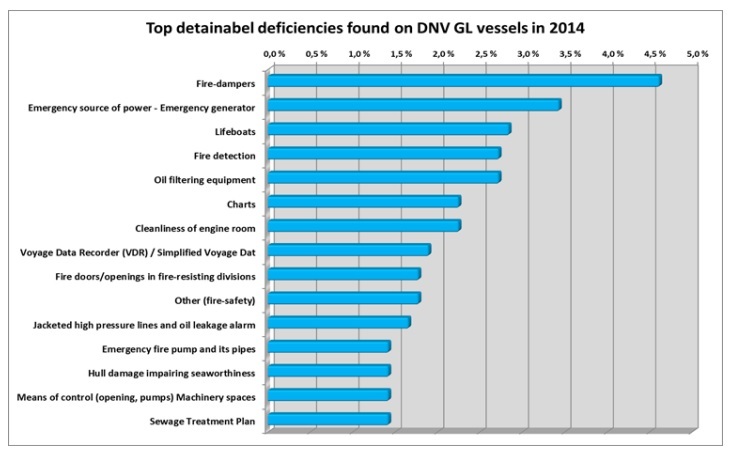 Fire dampers were the second-most-frequent detainable item found on DNV GL vessels in 2014, followed by deficiencies related to emergency generators and lifeboats. Below is a table that shows the most frequent items recorded by PSC. ISM related deficiencies have been excluded from the table. Fire Safety is the deficiency category with the most detainable deficiencies found on DNV GL vessels in 2014 and fire dampers are the most frequent of these. Needless to say, non-functional fire flaps and dampers seriously impair a vessel’s ability to fight fires on board, especially engine room fires. These defects are always a potential ground for detention, since fire flaps and dampers are a critical part of the ship’s fire-safety arrangements. Ventilation flaps and dampers shall move freely with all parts in place. The crew is to be familiar with the operation of fire dampers. Fire dampers/ducts indicated on the Fire and Safety Plan are to be marked, indicating clearly which space the damper serves. Other ventilation inlet/outlet closings are preferably to be marked to the same standard as above. Operating handles and stoppers are to be in good working condition. A responsible officer is to be assigned for maintenance and inspection. Periodic maintenance and required tests of local and remote operation are to be carried out. Adequate testing procedures are to be stated in the vessel’s PMS and/or SMS. Open/closed positions are to be properly marked. The vessel-specific fire-training manual is to explain in detail the operation and use of fire and smoke dampers. The checking and operation of fire dampers and the main inlets and outlets of ventilating systems are to be included in regular fire drill scenarios. Fire dampers are and will continue to be in focus, since they have a vital safety function in case of fire. It is important that the vessel’s crew execute proper maintenance procedures for fire dampers and make sure that they function properly. In 2014, nine DNV GL vessels were detained with detainable items related to fixed fire extinguishing installations. In the first quarter of 2015, two vessels were detained due to the fixed CO2 firefighting system not being ready for operation. For newbuildings, very often shipyards disconnect the CO2 system for safety reasons while there is ongoing work in protected rooms. It is therefore very important that the owners and ship’s crew ensure the system is operational as part of the pre-departure check. For the crew on board, inspections and maintenance of the CO2 and fixed fire fighting system shall be carried out in accordance with the ship’s maintenance plan by the crew and qualified service companies. During the pre-departure check upon delivery, it should be verified that the vessel’s fixed fire fighting installations have been put properly into operation after commissioning/testing in the yard. This check should preferably be carried out as close to the vessel’s sail-away date as possible and after all testing and maintenance is completed. Visually examine the individual lines connecting the CO2 bottles to the CO2 distribution piping system, paying particular attention to their tightness. Visually examine the CO2 actuator arms, valves, associated hardware and other piping connections for proper assembly and tightness (loose bolts, unions, control heads, missing gaskets and loose disconnected hoses). In order to assist owners to ensure that the vessel is in compliance, DNV GL has created a flyer with a list of the most frequent detainable items found during PSC inspections on DNV GL classed vessels. The list with top detainable items will be given special focus by DNV GL surveyors during periodical surveys to help owners avoid detentions. The list could also be used by owners for preparation for port arrivals and to ensure efficient expedition of class surveys.